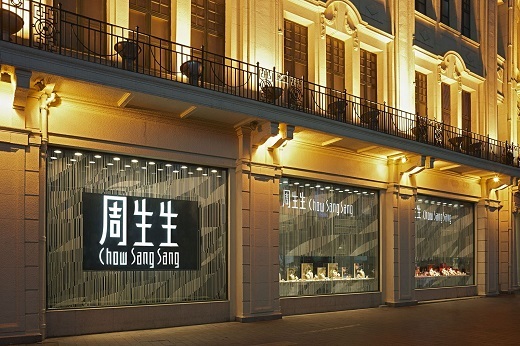 RAPAPORT... Hong Kong-based jeweler Chow Sang Sang saw a 13% rise in sales in 2018, amid improved consumer sentiment and a spike in gold demand in the first half of the year. Group sales came to HKD 18.81 billion ($2.4 billion) for the year, as revenue from jewelry retail increased 18% to HKD 17.13 billion ($2.18 billion). Proceeds from other businesses, including property, fell 21% to HKD 1.68 billion ($213.5 million). Profit jumped 15% to HKD 1.01 billion ($129 million), the company said last week. Revenue from mainland China rose 16% to HKD 9.33 billion ($1.19 billion), as the market for gold remained strong. Online commerce also improved, accounting for approximately 15% of the region’s total sales. In the local Chinese currency, revenue rose 13%, with same-store sales up 3%. Sales in Hong Kong and Macau climbed 10% to HKD 9.36 billion ($1.19 billion), the jeweler said. Same-store sales for the region slipped 18% due to a softening in demand in the fourth quarter. Chow Sang Sang gave a cautious outlook for 2019, citing concerns about the potential impact that trade tensions between the US and China a volatile economic market would have on consumer sentiment. While the jeweler had an average December holiday season and growth slowed in the fourth quarter, it noted sales during the Lunar New Year period in February were more positive, in both China and Hong Kong.